I recently went to the Big Island. When I was planning my trip, the two most important things that I wanted to do were to visit Mauna Kea and to see the lava. I researched how to see lava on the Big Island, and I learned that I could actually see it from a few different ways. The last time I went to the Big Island was three years ago. There was no active lava flow, so I was hoping I would get the chance to see lava flowing into the ocean this time. Although the lava has been flowing for a while, I wasn’t sure if the lava would still be flowing when I booked my trip six months ago. Pele, the goddess of lava, is tricky like that and quite unpredictable. You never know how long the lava will be flowing. Luckily, during my trip, I saw the lava from two different locations. 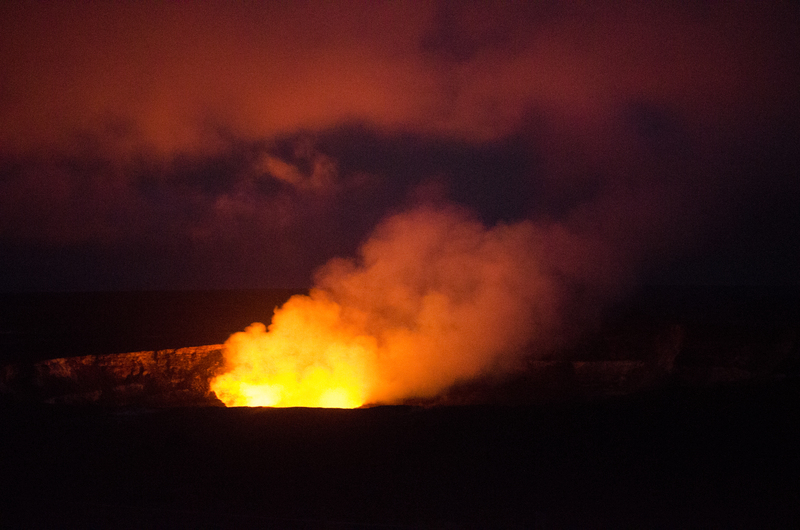 If there is no active lava flow, you can still see lava glow from Halema’uma’u Crater, an active crater. You can drive right up to Halema’uma’u Crater, making it a very accessible attraction. Although you won’t see lava flowing from here, it’s still a beautiful sight. If you go to Hawaii Volcanoes National Park, it’s my number one must-see. To see the Halema’uma’u Crater, drive to the Jagger Museum in Hawaii Volcanoes National Park. Here, you can read all about volcanoes and even touch some lava rock. There is also a gift shop and a bathroom. Here, you can always see the glow of the Halema’uma’u Crater. But here’s the catch — during the day, the glow appears to be white smoke. At night, the glow turns to orange and red and pink. Lava glow from Halemaʻumaʻu Crater. Visitors line up outside the volcano about a half hour to an hour before sunset to get the best views. As the sky darkens, the glow becomes darker and darker red. Pro Tip: Stay until at least a few minutes after the sky gets dark so that you can see the deepest colors of the lava glow. Everyone tends to leave as soon as the glow appears. But if you wait, the colors will get more and more intense. Pro Tip: Stay until at least a few minutes after the sky gets dark so that you can see the deepest colors of the lava glow. Everyone tends to leave as soon as the sun starts to go down . But if you wait, the colors will get more and more intense. When I arrived at Hawaii Volcanoes National Park, the first thing that I did was stop at the Visitor Center to talk to the Park Rangers. I knew that they would have the most up today information about the lava flow. The National Park Service also posts daily updates here. The Park Ranger told us that there are a few ways to see the lava from the Kalapana lava viewing area. The Kalapana lava viewing area is an hour drive from Hawaii Volcanoes National Park, where we were staying. It is also about 45 minutes from Hilo. From there, it is three miles on foot or on a bicycle to get to the lava viewing area. So, this trip might not be for everyone. The Park Ranger advised us to take sunscreen, snacks, and three liters of water with us. She also told us to wear long pants and hiking shoes. We followed all of her instructions, and I am so glad because it was a long journey from our hotel to the lava viewing area. I drank all of my water and ate all of my snacks. Once we got to the parking lot, we had two options. We could walk three miles to the lava flow or rent bikes and ride out there. We decided to rent bikes, which cost us $15 each. Our bike rental came with a helmet, flashlight, first aid kit, and an extra bottle of water. It all came in handy. We left the parking area at around 4:00 p.m. We wanted to get to the lava flow in time to watch the sunset. I have to say, it was really hard to ride the bikes on the gravel road! I might have been better off walking. When we got to the lava viewing area, we walked around on the lava rocks for a little bit, and then we settled into watch the lava flow. A Park Ranger was making sure that everyone stayed behind the ropes. You can see this lava flow during the day, but the lava is not as visible. It looks more like white smoke coming out of the water. We brought out our sandwiches and watched the show. The sound of the lava crashing into the water sounded like thunder! It was incredible. As the sun went down, the colors got bright and brither. Soon, I could see the lava pouring into the ocean right before my eyes. How often do you get to do something like that? Watching the lava flow was a bucket list item for me, and I am so glad I finally got to go after living in Hawaii for so long. Watching the lava flow was a bucket list item for me, and I am so glad I finally got to go after living in Hawaii for so long. Riding our bikes back was also a bit difficult. The gravel roads have no lights on them, so we relied on the flashlights that were provided to us. Then, we drove back to our hotel at the national park. Don’t be like me and wait until the last minute. Book your lava tour today! When you book The Lava Experience Jeep Tour with Hawaii Aloha Travel, you know that you will be getting the best lava views and the best insider tips. Our tour guides know exactly where to go to see the lava flow, where to take you, and, equally important, what to bring. That’s why going with a guide will probably be your best bet. Our Lava Experience Jeep Tour is 10-hours long and begins at 8:00 am with a Jeep ride from Kona/Waikoloa to Kalapana. A private tour guide will take you on a three-mile hike to get to the lava viewing area. When you reach the lava fields, your guide will take you to the best spot to view the active lava flow. They will also tell you all about the lava and provide dinner, water, and a ride back to Kona/Waikoloa. It’s a long and tiring day, so you will be so glad to have a ride back to your hotel. For more information, click here or give our travel agents a call today. While the lava flow can be somewhat unpredictable, I highly encourage you to go if you can and if the lava is flowing. If the lava isn’t flowing during your trip to Hawaii, don’t be too disappointed. That just means that you have an excuse to come back one day! Plus, you can still explore Hawaii Volcanoes National Park, view hardened lava rock, and visit Halema’uma’u Crater.